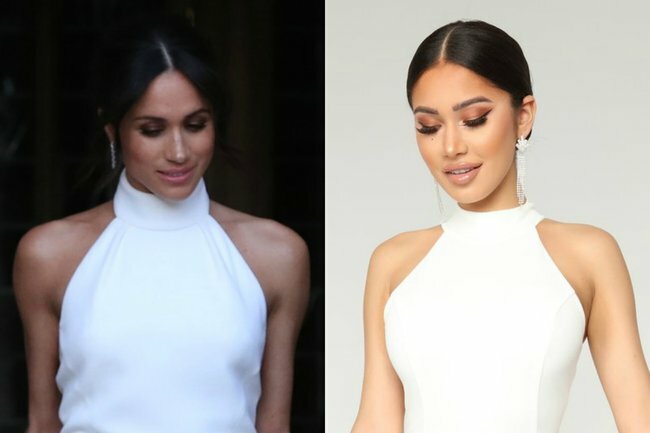 This $60 copy of Meghan Markle's wedding reception dress is gorgeous. Just a little more figure-hugging. Image: Fashion Nova. The main difference is that this dress is styled as being just a little bit more figure-hugging than the Duchess of Sussex&apos;s gown. Also, we&apos;re just guessing that Meghan&apos;s dress wasn&apos;t made out of 96% polyester and 4% spandex. But it&apos;s fully lined and, according to the more than 30 four and five-star reviews posted on the site so far, looks just like the picture. The dress ships to Australia for US$15 (AU$20) - but for $80 total it&apos;s still a total bargain. But you&apos;re going to want to get in quick. We saw the dress has already sold out once - and just came back in stock for sizes XS to XL. The perfect consolation if you missed out on buying Buckingham Palace&apos;s $73 replica of Meghan&apos;s engagement ring. Have you bought a replica of a celebrity&apos;s dress before?